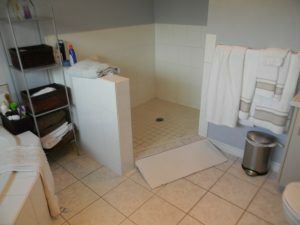 »Home»BC Senior Safety Services Blog»Walk in Tub or Accessible Shower? Walk-in tubs work out really well for those who enjoy taking a bath for both personal hygiene and therapy and do not want to give this up when it becomes increasing more difficult to lower themselves down and get back up from a standard bathing position due to age, an injury or illness. They have helped thousands of people retain their bathing independence and also return this pleasure back to so many more. Our company stocks a large supply of different size tubs with various jetting options and if possible we encourage those considering this purchase make an appointment to visit our warehouse storage to view and sit in the tubs. Our fully jetting high gloss acrylic walk-in tubs including an in-line heater can be professionally installed for less than $10,000.00 tub included. Soaking tubs (tubs with no jets at all) can be as low as $8,000.00. (based on a standard 60 inch tub cavity) Please allow two days for the installation, for more details call 604-940-8814. The fill time on a walk-in tub is totally dependent on water pressure. A fireman with his hose could fill a walk-in tub in seconds, however a homes water pressure can vary depending on what the water main regulator is set at. Want to know how long it will take to fill? Fill you’re standard tub to the overflow and time how long it takes to do this, it will be about the same for a walk in tub, or run the water from the tub spout as much as you can while maintaining a bath water temperature, slide a five gallon pale under it and time how long it takes to fill, then do the math. The average size walk in tub holds about 45 – 65 US gallons, but you’ll take up room, so subtract a gallon for approximately every ten pounds below the water line about 65 – 70% of your total body weight. Draining takes the same amount of time as a standard bathroom tub. So this is real easy to figure out. Fill a standard size tub up to the overflow and time how long it takes to drain. 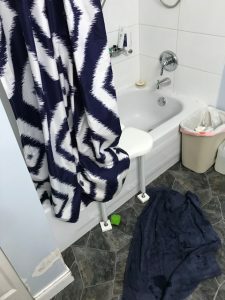 A walk-in tub’s drain simply connects to the existing one. A full tub with a properly functioning drain should drain in about 3 minutes or less. We do not recommend quick drain pumps ...read more. 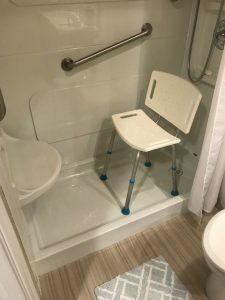 For those who don’t mind waiting while a tub fills and drains, perhaps using this time to wash their hair or rinse themselves off with a hand held shower head, then walk in tubs are recommended for those wanting to retain bathing independence. Do walk-in tubs make a good stand up shower? Not really, due to the molded in seat walk in tubs have limited standing room unlike a standard tub. Replacing an existing standard bathtub with a fully accessible safety shower is recommended for those who prefer showering over bathing. It is also recommend for those who require caregiver assistance to help with daily hygiene. 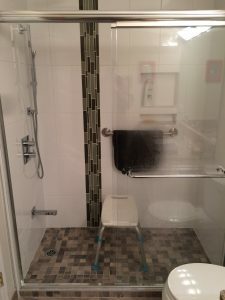 It is easier and takes less time for a care giver to lend assistance with an accessible shower. Glass shower doors are attractive but can greatly restrict accessibility to lend assistance. It is recommended fully accessible showers be fitted with shower curtains not glass, especially when caregivers are needed. 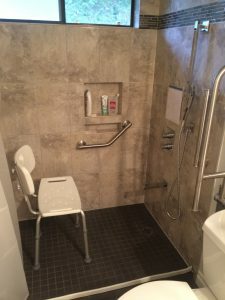 Accessible shower bases have a large flat stable platform so users have more room and feel far more secure while sitting in shower chairs, opposed to having the chair legs teetering on a bathtubs narrow radius bottom corners. Built-in wall niches for soap and bottles allows more room and less clutter. 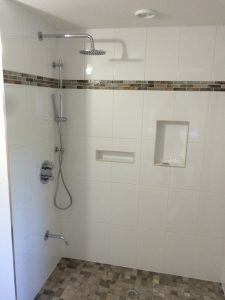 Our custom built accessible tiled showers will add beauty and style to you’re bathroom. Some of our customers prefer glass shower doors. Tub to shower plastic retrofits kits come in 4 to 5 pieces. One piece plastic shower stalls are way to large to maneuver through a finished home and fit into and existing tub cavity. 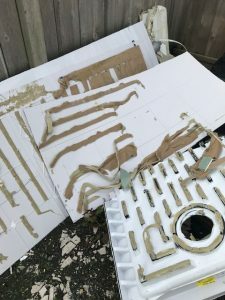 These acrylic or FRP(fiberglass reinforced plastic) kits are very popular with bathroom retrofit companies because the installations are quick and require far less skill, labor and materials. 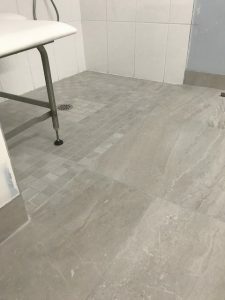 However, the lower costs on labor and material won’t show up in the end price with them starting at around $9,000.00 plus, not much different than beautiful custom tile. Plastic retrofit products show reasonably well when installed properly but can be prone to leak risks as seen below. These two photos are of a brand new five piece shower kit that replaced a standard size tub. The shower back has two pieces, there are two end pieces and then the base. It was installed as well as to be expected by the contractor. A major fault of tub to shower kits are the corners where silicone is used for waterproofing. 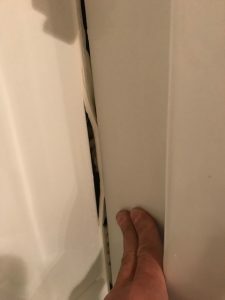 This photo shows the faucet end of the shower where the end piece and back piece come together in the corner. Pushing only slightly flexes the plastic enough to break the silicone sealant in the corner and now the shower is sure to leak. The opposite end was the same. 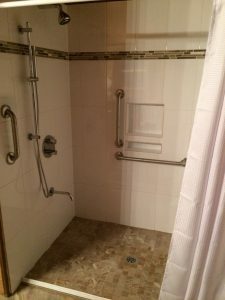 Special Projects Using Tile – Floor level Wheelchair shower retrofits. 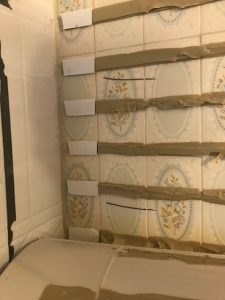 Simply fastening thin sheets of plastic over old tile and wall board to avoid the expense of removing and properly disposing of the material is being seen more frequently. Concealed old plumbing fixtures are often left in place and easily repaired problems are never fixed. The sales pitch is your saving money and its sparing you from a lengthy messy bathroom renovation, but it can still cost close to $8,000.00 or more for just hundreds of dollars in material and a days labor! Thousands was spent to have this done, glue and a few hundred dollars of material and days labor! Removing the old tile and doing a correct job would not cost much more. 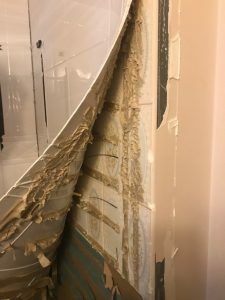 When renovating bathrooms and replacing a tub with an accessible shower the demolition in most cases involves the removal of a tiled tub surround. Even after decades of use the tile is in good condition and except for perhaps the color or style being dated it looks like new! We can’t say the same for the plastic showers we’ve ripped out, there faded, scratched and tired looking. 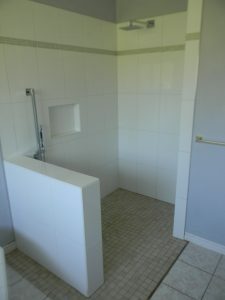 Contact us for more information on our custom built, safe, accessible tiled showers.